All procedures followed were in accordance with ethical standards of the responsible committee on human experimentation (institutional and national) and with the Helsinki Declaration of 1975, as revised in 2000. Informed consent was obtained from all patients for being included in the study. Tack, M. (2019). Fear avoidance in CFS/ME: Invalid results. 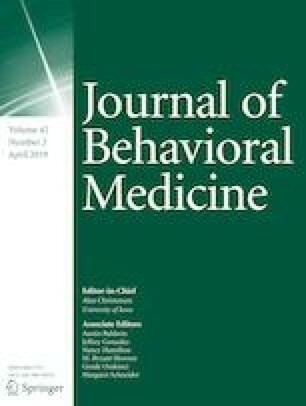 Journal of Behavioural Medicine. https://doi.org/10.1007/s10865-019-00033-4. Twisk, F. (2019). Cognitive-behavorial and graded exercise therapies for chronic fatigue (syndrome) are associated with lower levels of work/school attendance. Journal of Behavioural Medicine. https://doi.org/10.1007/s10865-019-00032-5.